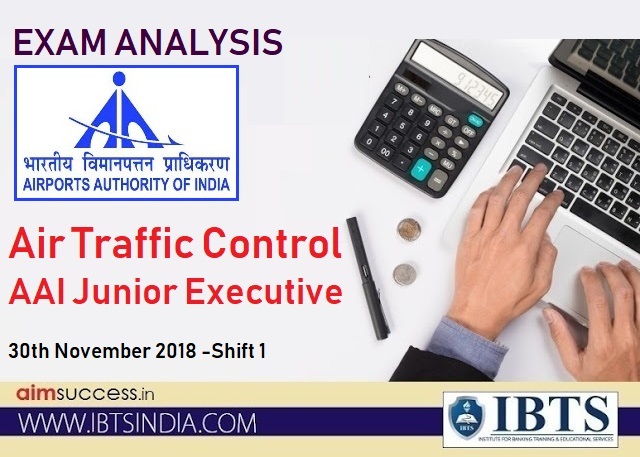 Air Traffic Control AAI Junior Executive Exam Analysis the Exam: Airports Authority of India (AAI) is being conducted exam today i.e., 29th November 2018 for the post of Junior Executives. This article about AAI Junior Executive Analysis 2018 provides all the AAI aspirants detailed review of the exam with difficulty level and the types of questions asked. Read this AAI exam analysis 2018 to analyse your paper. Go through the below table accurately to know about the number of questions asked for different topics of English Language.This analysis makes this contemplation stronger that same distribution of questions from respective sections is also expected in other shifts of AAI Junior Executive 2018 Exam. For your convenience, we are providing the exact number of questions asked from in todays Shift of AAI (ATC). KJPO : PQKL :: LINO? One numerical based on "Exactly divisible by preceding number but not by succeeding"
Questions asked in the quantitative aptitude section of the exams are of moderate level. Go through the table below to know about questions asked from different topics of Quantitative Aptitude. Below we have provided the number of questions from the relevant topics in the exam of AAI Junior Executive ATC. Who was the winner of Cricket world cup 2015? Who is Deity of Elephanta cave? Style of painting belonging to Maharashtra. India rank asked in world press freedom index. Phosphorus burn in air then which type of combustion takes place? Who is the speaker of Lok sabha? Numerical: Energy was given, you have to find speed of electron.